The RESTOP System of portable toliet bags is ideal for emergency and disaster situations when sanitation facilites are disabled or unavailable, or for outdoor and over the road situations when you got to go and there are no facilities. 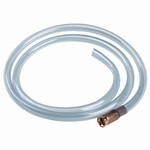 Each disposable toliet bag is designed for convienient and envionmentally safe disposable of human waste. After use, simply dispose in any trash container. The solid waste bag is designed with an innner zip lock closure that securely contains waste and odor, while a natural blend of polymers and enzymes instantly begins to break down the waste and turn it into a deodorized gel. The bag may be used with a portable 5 gallon potty recepticle (see RE-984-03) or used directly on the ground. bag includes instructions, tissues and antiseptic wipes. The liquid waste bag has a unique funnel and one way valve to prevent accidental spills and will not leak even if turned upside down. 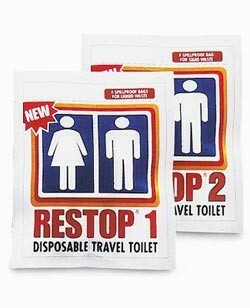 Designed for either male or female use, each bag can be used multiple times. Absorbent polymers in the bag instantly turn warm body fluids into an odorless gel. After final use toss into any trash container. Restop products proudly supports " Leave No Trace " Outdoor ethics. Please specify your choice of Solid or Liquid bag when ordering. 4 bags per kit.